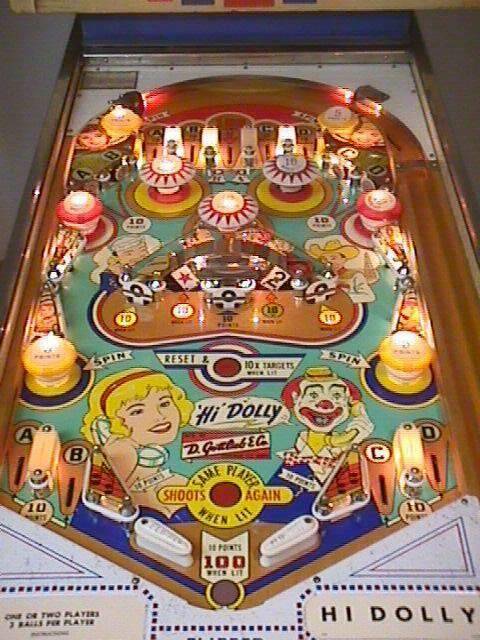 » Forum » Electro-Mechanical » EM Pinball Hangout » Can you name this game? » Can you name this game? I owned a game in the 60's (Christmas present!) and I love to figure out what it was. It was circus/fair themed I believe and it had a "Price is Right" style wheel sunk into upper middle. The wheel would turn to increase point value when you hit things but the max value was "50" (as I remember). My guess is it was built between 1958 and 1963. It was a four person scoring game. 'Hard to believe I played a zillion games on it but 'can't remember the name. A little late for the years you're guessing but maybe GTB King of Diamonds? Thanks for the guesses. Kismet is pretty close - same style of game. 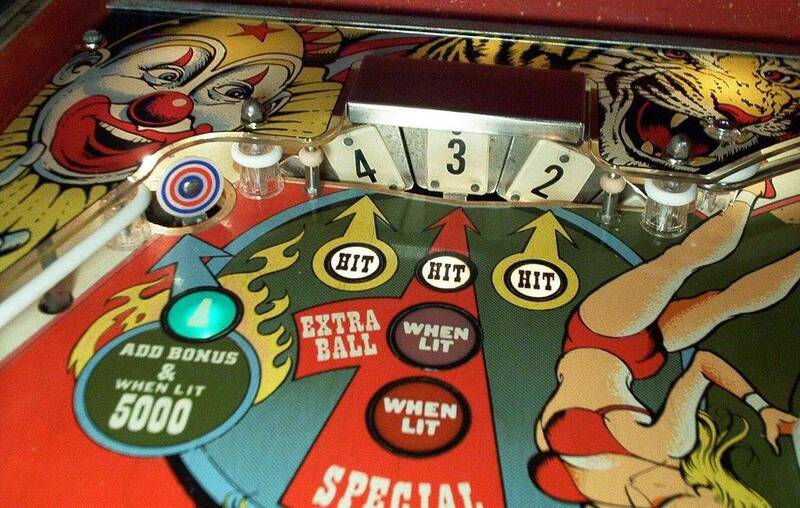 But think of a scoring wheel mounted low under the playfield so you only saw one or so numbers. You could advance the reel by hitting a target and then every time you hit a pop it would register those points. I think the scale went from 5 to 50 points. I remember this because the coil advancing the reel went bad so I replaced with the extra game kicker coil. I think he's describing a vertical reel, like on Klondike/Yukon/Gold Rush, but one with numbers, 4-player game, circus/fair. It wasn't a woodrail - 'was later than that but still had stenciled side art . Correct it had a vertical reel set in the middle upper playfield. My first thought was Gottlieb Circus, which has a roto target in the upper left playfield. But it's a SS from 1980. Maybe a Gottlieb Roller Coaster from 1971 with the big dial in the upper playfield? The Williams games (Klondike/Yukon/Gold Rush) are the only ones I can think of which have a true 'vertical' reel on the playfield. And of course none of those match the year or theme. Surely there must be more games that had a vertical reel on the field? and vertical reel or roto target? The only ones I can think of off-hand that had a single playfield reel like that are Jungle and Friendship 7. Neither with a circus theme or multi-player. Caravelle maybe? Although the theme seems to be Paris, it is a 4 player with a center vertical reel. Hmm, how about Mardi Gras? Mardi Gras seems promising based on the description except it actually has two drum units on the sides. Well, there are more apparently. Another good possibility but only 2 players. I know this has been metioned before but could it be "Hi Dolly"? someone fell off the Eiffel and was referred to as "that clown...."
Off topic but I'm glad clowns are not as popular as they used to be. The clown calling Dolly on the telephone on the "Hi-Dolly" machine is really creepy. 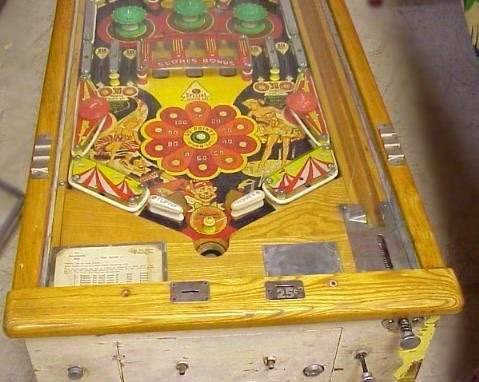 Correct it had a vertical reel set in the middle upper playfield. Can you narrow it down a bit with the style/type of vertical reel you are remembering/describing? And we also know it is not a multi slot reel on PF game. I'm thinking it was Caravelle. I guess the theme was not as I remembered or they released a similar rethemed game. 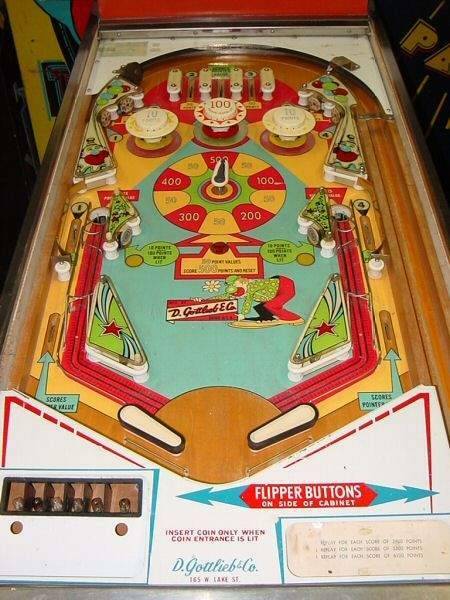 The playfield picture though blank looks spot on as to placement of stuff. The year 1961 was about perfect - my dad purchased it for $50 and it was about 5 years old in 1966. I guess that's about $450 in todays dollars (gas was 3 gallons for $1). Thanks for all the answers! I'm thinking of picking up a nice EM to give my WOZ some company. I just looked at Caravelle again - The playfield is correct but the cabinet is wrong. It didn't have that odd shelf near the shooter. You sure it wasn't a wood rail? Look at funhouse again. No - wasn't a woodrail. I had a 1941 Spot Pool that was woodrail so I knew the difference a an early age. It just had a center single reel - placement of pops and reel was very close to Caravelle. It looked like they took a regular scoring reel, downsized it a bit, and mounted it under the playfield just like in Caravelle. BTW - O-Din- I guess you realize where I got the inspiration for my avatar. Nice! Now get those old Christmas photos out and tell us what game you had.